Mario Corcione, designer at CO-REF Srl. When shopping for frozen food, consumers expect top quality and freshness. Until food is prepared and served, whether it be vegetable, fish or meat, it needs to remain fresh and completely frozen. In order to achieve this, it is vital that fresh produce is frozen as quickly as possible during the production process. 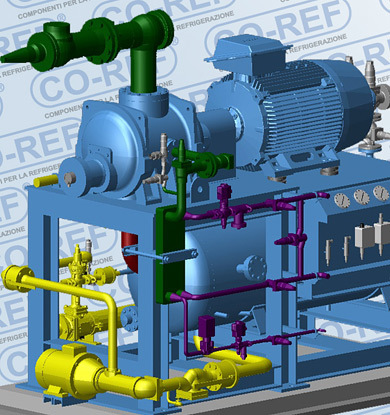 CO-REF Srl, based in Italy, are a major supplier of compressor systems which utilise Howden screw compressors. The company was established in 1988 and, since then, has continuously developed its offering through the use of cutting edge technology, towards the goal of highest efficiency. Today, CO-REF Srl is a leader the field of compressor production for the cooling and deep-freeze industry. Since its inception, CO-REF has developed into a leading Italian compressor producer and is now one of the most important suppliers for industrial deep-freeze applications. Today, the company can accommodate individual customer requirements better than ever before. One of the company’s strengths is the manufacture and production of compressor units tailored to meet the customer’s specific needs. The compressor units produced by CO-REF are frequently utilised in cooling systems within the food industry, such as in deep-freeze warehouses, freezers or refrigerators, to keep frozen products fresh for very long periods of time. 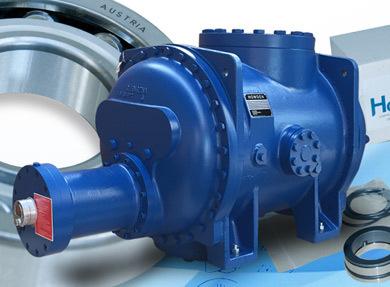 For CO-REF, a major challenge was to be able to quickly and easily design compressors that contain components from other suppliers as well as their own parts. To meet this challenge, a design solution was needed that could import 3D component models from suppliers, and also enable CO-REF to quickly design their own 3D parts. 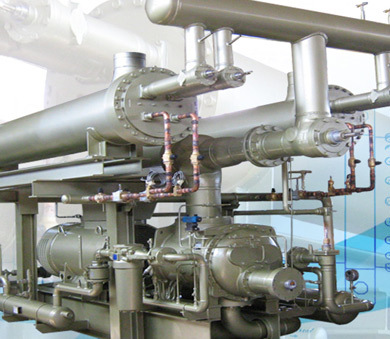 Furthermore, the capability to design pipework around components was also required. Another challenge was to be able to design the layout of a compressor system for a customer’s site and ensure there would be no obstacles during installation. Therefore, 3D visualisation, walkthroughs and collision detection were of paramount importance for the layout process and for customer presentations. 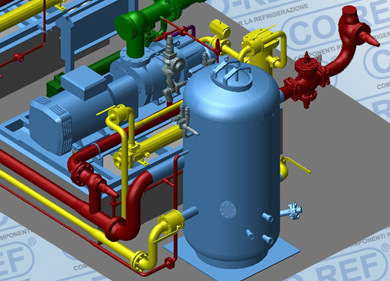 By using the MPDS4 plant design & factory layout software to design compressor systems, CO-REF gains a competitive advantage with the ability to produce high-quality, large-scale designs. ‘CO-REF is an innovative company with very high standards. MPDS4 is capable of meeting all of CO-REF’s requirements and helps the company to acquire new projects and customers every day,’ explains Marco Destefani, CO-REF customer advisor at CAD Schroer. The MPDS4 system offers extensive 2D and 3D interfaces, which enable CO-REF to effortlessly exchange data with customers and suppliers. Moreover, comprehensive 3D modelling capabilities facilitate the design of CO-REF’s own parts, and specialised tools for pipework design, underpinned by standards-based piping component catalogues, enable CO-REF to quickly design and route complex pipework. Once a design is complete, construction drawings and detailed parts lists can be quickly generated directly from the model. 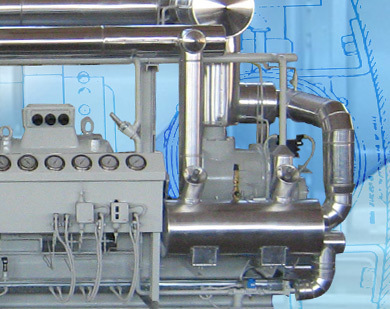 MPDS4 enabled CO-REF to raise the design quality of it compressor units. Costly mistakes during assembly were therefore minimised. In addition, the company can now also undertake larger projects, with a much higher level of complexity, and with significantly more components than before. By designing in 3D, CO-REF is able to communicate and review the design far more effectively with the customer, to the extent that the customer can inspect the design at the very first meeting and provide immediate feedback. During the redesign of its website, CO-REF decided to present its product portfolio using an impressive overview video. A selection of individual compressor components and the overall product range were to be shown in detail. Using MPDS4’s interfacing capabilities, CO-REF was able to export detailed 3D models ready for use within a video rendering program. This facilitated the production of a comprehensive video-based product presentation. ‘We are very proud of our innovative products. Through the use of MPDS4, we finally have the ideal way to showcase our products,’ explains Mario Corcione of CO-REF.